Thanks to my new girlfriend Daisy, I'd like to bring you yet another amazing (and amazingly easy) recipe: Camarones Ajillo, or Shrimp in Garlic Sauce. This recipe, a classic Latin dish, passes the five easy questions test with flying colors and it is utterly delicious. I am always on the lookout for dishes like this that are easily made and uncomplicated, yet still somehow just a bit exotic--at least to my simple New Jersey palate. And of course I'm particularly partial to any recipe containing shrimp. 1) Heat the oil and red pepper flakes in a large non-stick skillet over medium-low heat just until the oil starts to color. 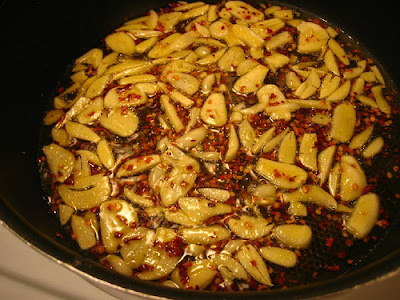 Don't heat the red pepper flakes over high heat or they will discolor and turn the oil bitter. 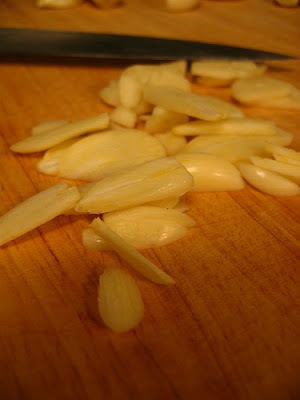 Stir in the garlic and cook, shaking the pan, just until the garlic begins to color, about 2 minutes. 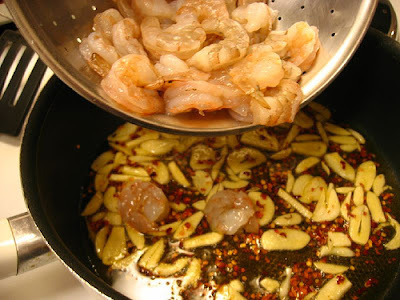 2) Increase the heat to high, add the shrimp, and season them with 1/2 teaspoon of salt (see note 3 below). Stir the shrimp so they cook evenly until they turn pink. Keep an eye on the garlic. It will continue to brown, but don't let it burn. If it starts to darken, lower the heat and remove the pan from the heat for a few seconds. 3) When the shrimp are pink all over, pour in the sherry and bring it to a boil. Cook, stirring, until the shrimp are cooked through and the liquid has been reduced by about half and lightly thickened, about 3 minutes. Stir in the parsley. 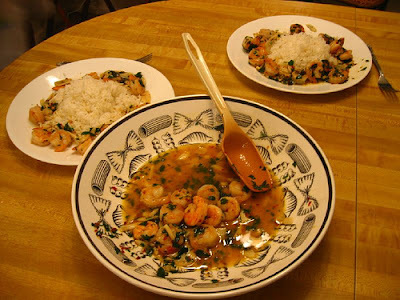 Scrape the shrimp and the sauce into a serving bowl and serve hot. 1) Be sure to use only high-quality ingredients for this dish, and be particularly sure to use only extra-virgin olive oil. As Daisy says in her book, simple recipes like this just don't give you anywhere to hide. 2) This is a textbook example where you need to read the recipe twice, because there are definitely some timing issues in the making of this dish. 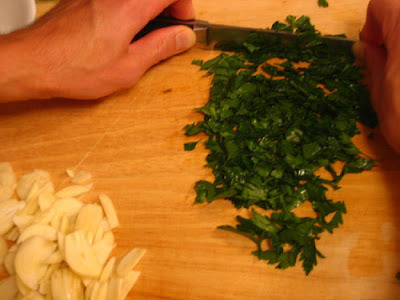 For example, if you flake out and don't already have the parsley rinsed, chopped, and at the ready when it comes time to add it in, you will have overcooked shrimp. Always make sure you have a sense of the "rhythm" of a recipe before you plunge in. 3) Long time readers of Casual Kitchen of course know that using excess salt is cheating. However, it is not cheating to use some salt in the particular case of this recipe (as is often true in cooking, a dash of moral relativism comes in handy on occasion...). 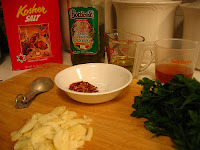 I modified the recipe slightly to use half of the salt the recipe originally calls for, and found that just that small amount of salt is all it takes to concentrate the flavors of this the dish. 4) Regarding shrimp size: the recipe in its original form calls specifically for 10 jumbo shrimp, but almost any size shrimp will do here. 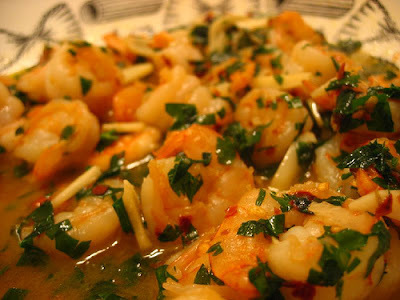 Just make sure to use two pounds of shrimp in order to keep the ratio of ingredients in the recipe constant. Also, the smaller the shrimp, the shorter the cooking time for said shrimp. Be mindful of this variable--nobody wants to eat tough, overcooked shrimp. Finally, I've added below some selected photos from the making of this dish, as Daisy's cookbook unfortunately does not contain any photos or illustrations of the steps of this particular recipe at all. It's one of the very few weaknesses of her cookbook. Believe me, it was. One of the best meals we've made in months. Thanks for your comment!